Did you know, scribbling is the foundation of writing? When your toddler begins to color with crayons or markers, those scribbles and swirls may not look like much, but they are the stepping stones to creativity, free thinking and learning to write. See! I told you toddler wall art had a silver lining! Annoying wall art aside, art introduces a child to a whole new world, full of decision making and self-evaluation. 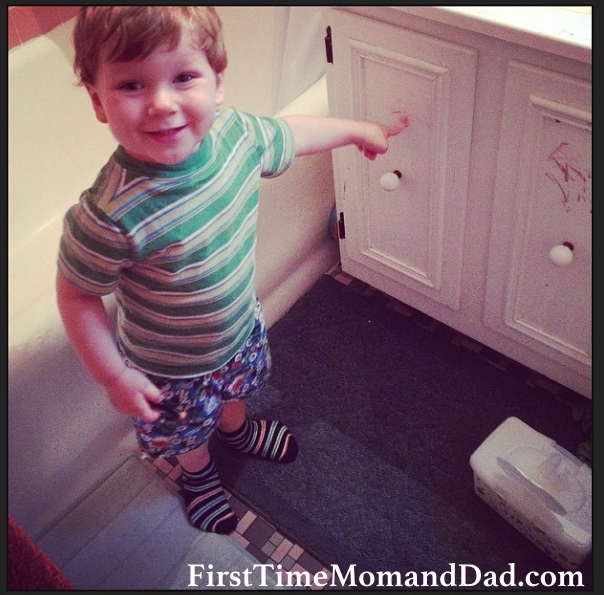 Here are five tips to help your toddler find his/her inner artist! 1. Create a creative space! To encourage his inner artist, provide a special space to create the masterpiece. Start by taping a big sheet of paper to the table or floor to give plenty of space to scribble and swirl. If you're concerned about anything getting messy cover it up, because things are going to get very messy! 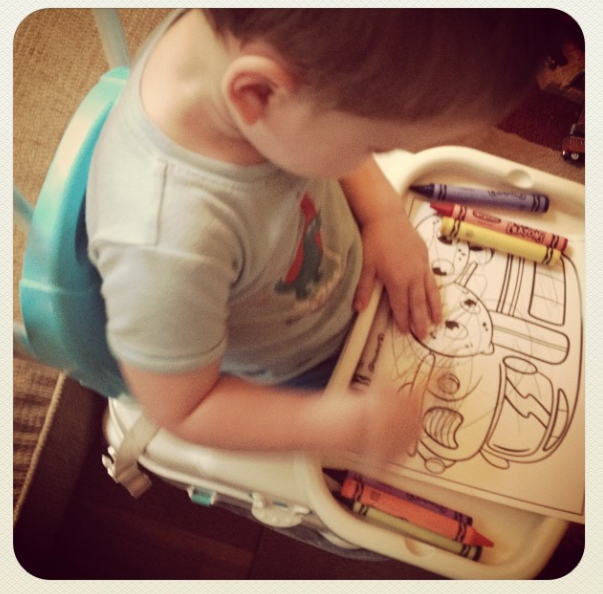 Tip: For little budding artist-Tape a few sheets of paper to the tray of a high chair; fully covering the surface. Taping the paper down will not only protect the surface from the budding Picasso, but also reduce the chances of frustration from the paper shifting during furious scribbles. Tip: Don’t be discouraged if your toddler is not interested in scribble sessions, introduce other creative avenues until he finds one he likes. Try offering rubber stamps or making collages using glue and paper and things you find in the garden; grass, small sticks, leaves and feathers. Break out the clay, water-based paint and sponges, and any other mixed media that will pique his inner Picasso. 2. Understand it's a process, expect some frustration- Your toddler's first few coloring sessions will be more about cause and effect than anything. She's first going to learn that crayons leave marks when pressed on paper. The excitement will quickly lead to wild swirls and scribbles. Until she can control her hand and arm movements, both together and separately, expect large wild scribbles with full circular arm motions. FYI: Most children cannot hold a writing utensil like an adult until close to three years old. Once your little one begins slowing down the colorful swirls and begins coloring with purpose, she’s figured out that marks and lines can represent objects, shapes and letters. Soon every crayon stroke will represent something — those swirly loops may be the family pet or those vibrant stripes may be you! This shows that she knows he can convey meaning with his pictures. 3. BACK OFF! Allow your budding Picasso to experiment and explore creativity without intervention from you. This is about his vision, not yours. Allow him to mark, scribble and create freely to encourage creative independence. Offering praise and encouragement from the sidelines will boost self-esteem and independence. Hand over a few chunky, nontoxic crayons (they’re easier for itty-bitty hands to hold and are harder to break), and let him go wild! 4. Add In Some Art Therapy-Encouraging children to think about their feelings and express them visually teaches processing emotions in a healthy manner. Art therapy helps children build resilience, promotes self-awareness, improves self-esteem and competence, develops coping and control skills, and leads to a stronger future. The next time your little Picasso wants to color, encourage him to draw what he is thinking or feeling. Pose questions she can answer through drawing. “Can you draw the sun?” “Is your sun smiling?” Let her know you are listening and proud of her work. 5. Be The Proud Parent- Your little one will be absolutely mesmerized by his new talent. Every mark he makes he is proud of, and you should be too! Proudly showcase your Picasso’s masterpiece on the refrigerator to show you love his art as much as he does. Parent Tip: Use this time to create coloring boundaries. Explain that art belongs on paper, not the wall. You might also throw in that crayons are better than mommy's eyeliner!